Back by popular demand here is K with another book review. 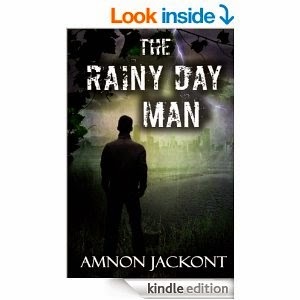 This one is called The Rainy Day Man by Amnon Jackont and you can get it for $3.21 from Amazon here. I don't think he was too thrilled with this book because it took him the whole 35 days to read it. So here he is with his review. Hi everyone it is me K with another book review for you. It is called Rainy Day Man by Amnon Jackont. I give this book 3 out of 5 stars and here is why. This is a story about a man whose job was to diffuse bombs who has gotten a different job and has been stationed in a village. He was supposed to meet a contact but can't find him. Later it is revealed what happened to him but I don't want to give too much away so I will keep that to myself. The story got way better and more interesting near the end but I had lost interest and had basically checked out long before then. If my mom hadn't keep yelling at me to finish I never would have. If there would have been a better plot line I probably would have given it more stars. I am not saying that this was a bad book but it was slow and not like the books I prefer to read. The story was good but hard to follow. * The main character introducing himself at the beginning of the story. * Learning what the MC's job was and his retirement. * The MC describing his family. * The MC even let me (the reader) know that he loves classic books. That pretty much sums up what I liked about this book in the first half you know before the action started in chapter 11. In conclusion if you can get past the first 10 chapters or so of this book you will enjoy the rest of it. The problem is that you have to read the first 10 chapters to understand the last 4 chapters. I don't think that I will read this book again. I absolutely love reading your book reviews, K! You are very insightful!